If you have reached the important decision to go out shopping for a new mattress then you will be presented with many options. You might want to stick with the same size bed that you’re sleeping on now but there’s no reason why you can’t upgrade to the next level. This would be especially true if you’re lucky enough to be sharing a bed with someone and have found that there is just not enough room for two! Among the sizes you’ll be able to pick from are the standard twin, the twin long, the double, the full and the Queen. 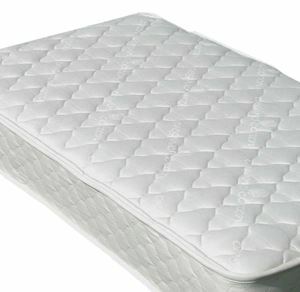 There are also two types of king-size mattresses to select from: the Eastern King and the California King. If you’ve never had the simple pleasure of sleeping on the king-size mattress you really don’t know what you’re missing! The King mattress is 76 inches wide and puts it at around 18 inches wider than your normal queen size bed. This allows each person 38 inches of elbow room. That’s about the same as you would get twin beds together. In fact most King mattresses come with twin box springs that make it easier to deliver. That’s because you can bend the mattress around the doorframe you can’t bend a box spring! The California King is the same width as the Eastern King but it’s longer by about 4 inches. This is a great choice for people who are six tall or taller and also comes with twin box springs. It might seem like a bit of access to sleep on your own in a King size mattress but you certainly can’t complain about running out of space with a King mattress. Even with all that extra space you’ll still be able to “meet in the middle” if you so desire. Before making the switch from a Queen to a King you need to make sure your bedroom can accommodate the extra space. This means it’s time to break out the tape measure. Although the rest of your bedroom furniture can still be part of the room you will definitely have to replace any headboard you have. Additionally, you need to make arrangements to have your old mattress taken away. While it is true that some mattress companies offer mattress removal that is not something you can always guarantee will happen. If you hire an experienced mattress removal crew like Junk King Oakland then you can depend on them to get the job done. The other benefit is that this same crew probably will be able to remove some other junk items from your home during the same appointment. That is definitely something you won’t be able to accomplish with your mattress delivery guys. This could mean you have the perfect opportunity to not only get rid of your old mattress but also get rid of some old furniture, electronic waste, garbage and other clutter that might be taking up space. You’ll get a good night sleep and have more room in your closets! This entry was posted in East Bay Junk Removal, Oakland Furniture Pickup, oakland junk removal, oakland mattress disposal and tagged get rid of old mattress, Oakland Furniture Pickup, oakland junk removal, oakland mattress buying, oakland mattress disposal on September 1, 2011 by Junk King. Last updated August 4, 2017 .